The Month, London, 1891. First Edition. Disbound. Very Good. 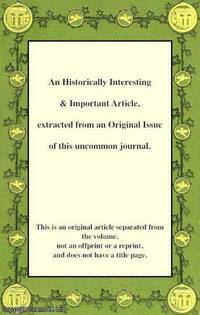 13 Pages Note; this is an original article separated from the volume, not a reprint or copy. Size: Octavo (standard book size). Quantity Available: 1. Category: The Month; Inventory No: 292722..
Fortnightly Review, London, 1891. First Edition. Disbound. Very Good Condition. Octavo. 19 pages. 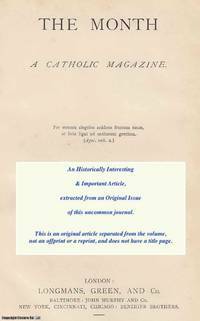 A disbound article with traces of library stamp in lower margins, not affecting text. Note; this is an original article separated from the volume, not a reprint or copy. Size: Octavo (standard book size). Quantity Available: 1. 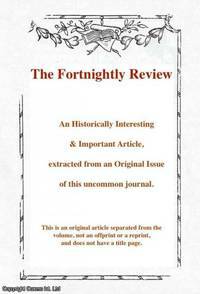 Category: Fortnightly Review; Inventory No: 044443.. The Month, 1885. First Edition. Disbound. Very Good. 13 pages, some foxing. Note; this is an original article separated from the volume, not a reprint or copy. Size: Octavo (standard book size). Quantity Available: 1. Category: The Month; Inventory No: 228509.. The Visitor, London, 1849. First Edition. Disbound. Very Good Condition. Note; this is an original article separated from the volume, not a reprint or copy. Size: Octavo (standard book size). 3 pages. Quantity Available: 1. Category: The Visitor; Inventory No: 290543..
Journal of the Asiatic Society, Calcutta, Vol.1, March, 1832, 1832. First Edition. Disbound. Very Good Condition. Octavo. 5 pages. Very Good. Note; this is an original article separated from the volume, not a reprint or copy. Quantity Available: 1. Category: Asiatic Society; Inventory No: 093733.. The Visitor, London, 1849. First Edition. Disbound. Very Good Condition. Note; this is an original article separated from the volume, not a reprint or copy. Size: Octavo (standard book size). 4 pages. Quantity Available: 1. 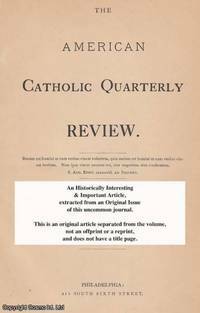 Category: The Visitor; Inventory No: 290516..
American Catholic Quarterly Review, 1888, Volume XIII, 1888. First Edition. Disbound. Very Good Condition. 29 Pages. Note; this is an original article separated from the volume, not a reprint or copy. Quantity Available: 1. 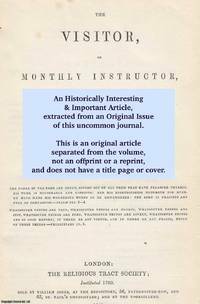 Category: American Catholic Quarterly Review; Inventory No: 144631..
United Service Journal and Naval and Military Magazine, London, 1831. First Edition. Disbound. Very Good. 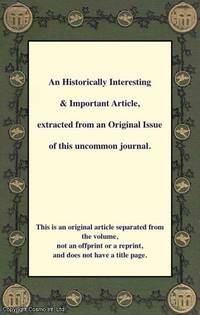 3 Pages Note; this is an original article separated from the volume, not a reprint or copy. Size: Octavo (standard book size). Quantity Available: 1. Category: Naval and Military Magazine; Inventory No: 293654..
United Service Journal and Naval and Military Magazine, London, 1835. First Edition. Disbound. Very Good. 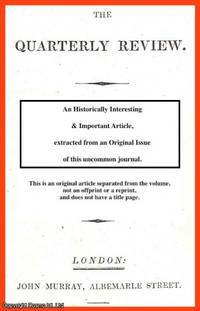 3 Pages Note; this is an original article separated from the volume, not a reprint or copy. Size: Octavo (standard book size). Quantity Available: 1. 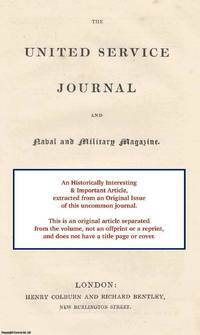 Category: Naval and Military Magazine; Inventory No: 294135.. The Visitor, London, 1849. First Edition. Disbound. Very Good Condition. Note; this is an original article separated from the volume, not a reprint or copy. Size: Octavo (standard book size). 4 pages. Quantity Available: 1. Category: The Visitor; Inventory No: 290519.. The Visitor, London, 1849. First Edition. Disbound. Very Good Condition. Note; this is an original article separated from the volume, not a reprint or copy. Size: Octavo (standard book size). 3 pages. Quantity Available: 1. Category: The Visitor; Inventory No: 290495..
Quarterly Review, John Murray, London, 1938. First Edition. Disbound. Very Good Condition. 14 pages. Note; this is an original article separated from the volume, not a reprint or copy. Size: Octavo. Quantity Available: 1. Category: Quarterly Review; Inventory No: 173982..
Â British Astronomical Association, London, 1927. First Edition. Disbound. Very Good. 6 pages, 1 plate, 1 graph. Note; this is an original article separated from the volume, not a reprint or copy. Quantity Available: 1. Category: British Astronomical Association; Inventory No: 226527..
Quarterly Review, John Murray, London, 1939. First Edition. Disbound. Very Good Condition. 13 pages. Note; this is an original article separated from the volume, not a reprint or copy. Size: Octavo. Quantity Available: 1. Category: Quarterly Review; Inventory No: 174063..
Geological Magazine, London, 1964. First Edition. Disbound. Very Good. 14 pages, 1 figure, 1 fold-out table. 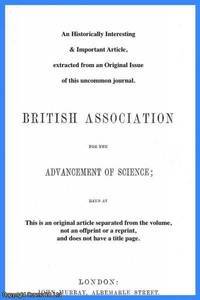 Note; this is an original article separated from the volume, not an offprint or a reprint. Size: Octavo (standard book size). Quantity Available: 1. 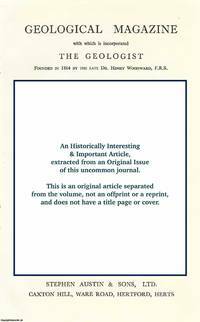 Category: Geological Magazine; Inventory No: 287452.. 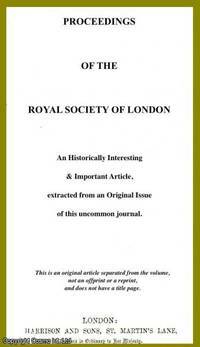 Proceedings of the Royal Society of London, 1900, Vol 67, 1900. First Edition. Disbound. Very Good Condition. 21 pages, textual figures. Note; this is an original article separated from the volume, not a reprint or copy. Size: Octavo. Quantity Available: 1. Category: Royal Society of London; Inventory No: 186882..
Scientific Memoirs, Selected from the Transactions of Foreign Academies of Science & Learned Societies, London, 1837. 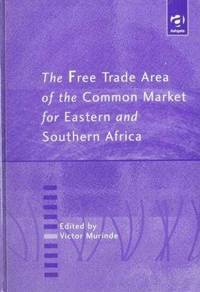 1966 Reprint. Disbound. Very Good. 24 pages. 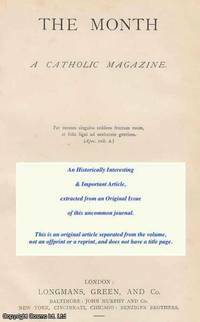 Note; this is an original article separated from the volume, not a reprint or copy. Size: Octavo (standard book size). Quantity Available: 1. 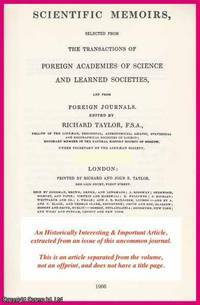 Category: Foreign Academies of Science & Learned Societies; Inventory No: 232304..
Report of the British Association for the Advancement of Science, 22nd. Meeting, Belfast, 1852, 1852. First Edition. Disbound. Very Good Condition. Octavo. 49 pages. Note; this is an original article separated from the volume, not a reprint or copy. Quantity Available: 1. Category: British Association for the Advancement of Science; Inventory No: 154232.. 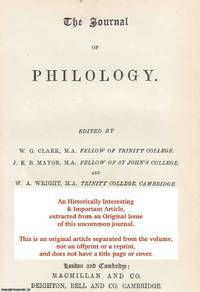 The Journal of Philology, London, 1876. First Edition. Disbound. Very Good Condition. 2 pages. Note; this is an original article separated from the volume, not a reprint or copy. Size: Octavo (standard book size). Quantity Available: 1. Category: Journal of Philology; Inventory No: 280769..